The Konica Minolta MagiColor 2400W is a small-form printer described as a color laser printer suitable for workgroup use, but in actuality it is far more suitable for individual, small home office, or home network use. 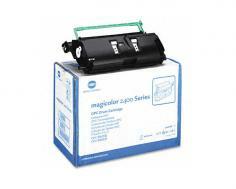 The MagiColor 2400W measures 16.9" by 19.8" by 13.4" and weighs 39.7 lbs without any cartridges include. With consumables included, the printer weighs 44 pounds. This makes it a much lighter and even smaller printer than the MagiColor 2300W and comfortably sized to fit on a desk or table alongside other equipment. The 2400W has a maximum resolution, in both color and black and white, of 2400 dpi, well above comparable consumer-grade or office printers. The 2400W is rated to print at speeds of up to 20 pages per minute in black and white and up to 5 pages per minute in color. The 2400W has a 200-sheet multipurpose tray and supports printing to Letter, Legal, A4, Executive, Statement, Folio, Foolscap, UK Quarto, Letter Plus, Govt. Legal, A5, B5, Kai 16, and Kai 32-rated paper. It also supports printing to envelopes rated at Japanese Postcard, Monarch, Com 10, DL, B5, C6, and C5. The printer is rated to print to plain paper, thick stock, glossy stock, transparencies, laser-quality labels and envelopes, though users complain about its reliability when handling many mediums (see Cons). The 2400W includes 32MB of SDRAM. Users have reported that contrary to the documentation included in the 2400W's brochure, a 10/100BaseTX Ethernet port is not included on the printer, requiring an external USB print server by either Konica Minolta or a third-party's print server in order to actually connect the printer to a network. The only other viable workaround is sharing the printer over USB, which will obviously require that the connected system be on at all times to enable printing. 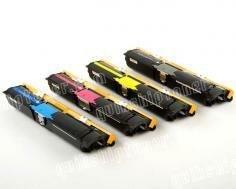 Even at the consumer level, the printer's color speed has been improved upon considerably. If printing color on a regular basis, you may wish to consider a newer printer designed to be more efficient than the 2400W. 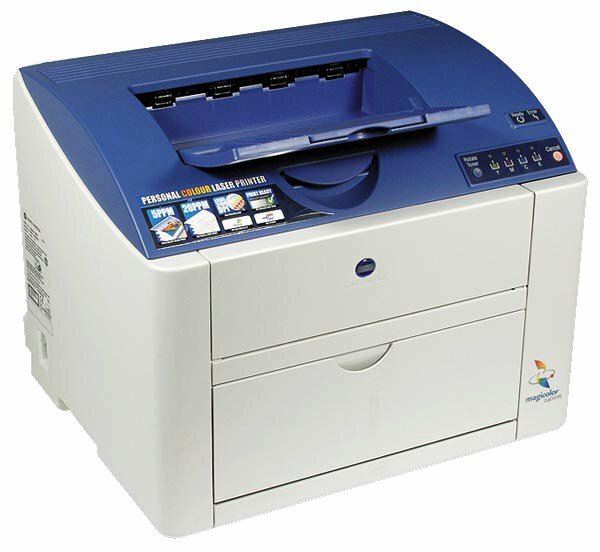 The 2400W includes a single USB 2.0 port, meaning that the printer will need to be connected via networking or through printer sharing if there are multiple users that need to print to it. The 2400W includes drivers for Windows 98SE, ME, 2000, and XP. There are no drivers available for current versions of Mac OS, Mac OS X, Unix, or Linux, nor does Konica Minolta have any plans to develop them. Windows Vista drivers are available as a download from Konica Minolta's web site, but drivers for Windows 7 are not currently available. The 2400W includes no additional paper handling features. Automatic duplex printing is not available. There are no options by which one can expand the 2400W. There is no room for additional memory and advanced paper finishing is completely and totally unavailable, as it often is in lower-end consumer grade printers. Many users complain of noise during warm-up as well as long warm-up times as well as its tendencies to smear toner on envelopes and to jam when handling more than 10 pages at a time after using the printer for an extended period of time. Review it: "Konica Minolta MagiColor 2400w "
Konica Minolta MagiColor 2400WThe Magicolor 2400W ships with cyan, magenta, yellow, and black toner cartridges with rated yields of 1500 A4 pages at 5% coverage, as well as a drum cartridge. Replacement color cartridges are available at yields of either 1500 or 4500 A4 pages at 5% coverage, and replacement black cartridges are available at 4500 A4 pages at 5% coverage. At every 45000 pages the drum unit will need to be replaced. This will likely synchronize with every ten black cartridges installed in the printer, though given that every individual's printing needs vary, it may not be as easy to calculate as that. The separation of drum and cartridges will bring down long-term costs to maintain quality printing, but will bring up the amount of maintenance you will need to do to ensure that the printer functions properly.